World Wildlife Day, held annually on 3 March, was created to celebrate and raise awareness of the world’s wild animals and plants. The day has now become the most important global annual event dedicated to wildlife. This year’s theme is “Life below water: for people and planet”. Oceans harbour a rich variety of communities and a wealth of strange and beautiful creatures, each with its own peculiar adaptations to underwater life. Right on our doorstep are two world-class marine hot spots – the unique waters of south-east Queensland, and of course, our iconic Great Barrier Reef. To mark the occasion we are sharing some of our Wild State vector artwork and spoke to Queensland Museum Graphic Designer, Baden Philips, about his design. Baden said the most important thing when considering the artwork was that it reflects the Wild State gallery concept of the environment and the animal being equally as important as one another. With these rich and unique environments shrinking and vanishing, there is a significant threat to the animals who call it home, with many becoming endangered or even extinct. Baden therefore wanted to create the artwork to be reminiscent of a jewellery advertisement, depicting the animals as rare jewels cushioned by a rich and luxurious landscape. To achieve this jewel-like quality, Baden chose low poly imagery (a polygon mesh in 3D computer graphics that has a relatively small number of polygons) and used Adobe Illustrator to create the drawing on top of the original image. Most of the designs are highly detailed, with each one representing hours of careful work. Read on for more information about the beautiful animals and habitats that make Queensland one of the most biodiverse places on the planet. Scorching summer days, freezing cold winter nights and dry almost all year round. But despite these seemingly adverse conditions, it is not devoid of life. Many animals, from large kangaroos to tiny invertebrates, have developed remarkable adaptations that enable them to survive in this extreme environment with very little water. Some travel great distances to drink, others get moisture from the food they eat, and some can control their body heat and limit water loss. Much of Queensland is covered by open forests and woodlands, which have long been described as ‘The Bush’. This is a place of light and, even when the trees are at their densest, the tree tops are well-spaced and allow direct sunlight to flood the often grassy floor. Bush animals rely heavily on the trees and shrubs for food and shelter, with some animals and plants evolving co-dependent adaptations that enhance their survival. Lush, dense plant growth, plentiful rainfall and litter-strewn ground – rainforests are one of the richest habitats on Earth. They have a dense ‘closed’ tree canopy that blocks sunlight and shades a litter-strewn forest floor, creating a multitude of spaces for moisture dependent animals to live. Southern Cassowaries are primarily found in lowland tropical rainforest, where conditions are hot and humid with frequent heavy rain. The Wet Tropics of North Queensland has 1,165 species in 6,300 square kilometres – more plant species than Finland, which is over 50 times its size. Many animals make the shore their permanent home despite challenging conditions such as deadly heat, little oxygen, pounding waves and, more significantly, our interference with this increasingly fragile junction of land and sea. Horn-eyed Ghost Crabs (Ocypode ceratophthalma) are fast running scavengers that are known to prey on baby turtles in tropical waters. Oceans harbour a rich variety of communities and a wealth of strange and beautiful creatures, each with its own peculiar adaptations to underwater life. Right on our doorstep are two world-class marine hotspots – the unique waters of south-east Queensland, and of course, our iconic Great Barrier Reef. Head to the World Wildlife Day website for more information on how you can get involved, and don’t forget to visit your native friends at Wild State during your next trip to the Museum! Been missing our Discovery Centre critters? Never fear, they’re all still here and safely tucked away behind the scenes throughout the Discovery Centre’s renovation. Our staff continue to bring in the tasty eats they like best – bundles of fresh gum leaves for our stick insects, dried leaves for the giant cockroaches and even frozen rats for our green tree pythons. The baby scorpions, born in the museum, are thriving on a diet of tiny crickets. The museum’s display and research specimens need to be kept in a controlled climate so they do not deteriorate, meaning that the museum is constantly air conditioned. But our live animals require humidity and every morning their enclosures receive a fine spray of water to keep them happy and healthy. The stick insects continue to lay eggs daily. These are sorted from the droppings and leaf fragments and placed into separate containers, and every morning there are new hatchling nymphs to care for. The nymphs live in separate enclosures of gum leaves, away from the adults, to make them easier to look after and avoid ‘throwing the baby out with the bath water’ when there’s a change of foliage. It seems that some of the animals are making the most of their well-earned break from the constant public gaze. The cockroaches have given birth to live young, so the leaves in their enclosure are now resounding with the pitter-patter of tiny new feet! Can the live animals still be seen? Yes, during our Daily Discoveries at 11.00am and 2.00pm we often bring some of them out to meet the public. You can even find out what’s on in advance if you call us on (07) 3840 7555. The schedule may be subject to change – but whatever is on – it’s always bound to be interesting! The “Zoo Animals” went into the tin with the blue lid, while my “Farm Animals” went in the tin with the green lid. The animal kingdom, as I knew it, lived under my bed in Streets ice-cream tins. All were classified, according to contexts developed from the songs, books and experiences of a four-year old. Fast forward to 2012 and, as a Museum Educator, I am delighted to be sharing the topic of Animal Classification with the next generation of biologists, taxonomists or collectors. If the concept of Animal Classification makes you numb, let us please change your mind. School programs are delivered by the Museum Learning team, using real collections to elicit real experiences. This is a valuable option in an increasingly virtual world. This program primarily responds to Science Understanding descriptors in Australian Curriculum: Science for Yrs 3 and 7, but also addresses Science as a Human Endeavour and Science Inquiry Skills for Yrs 3-7. So how does classification apply to our lives? You don’t even need to be a collector to use it. We find classification systems everywhere – from libraries to supermarkets. Things that are in some way similar are arranged together for comprehension and convenience. So how does animal classification apply to our lives? Animals are grouped as part of the process that describes or identifies them down to an individual species. This helps us effectively communicate information about them. Understanding characteristics of a particular species or group can affect our health and welfare, economic growth and ability to effectively manage the conservation of our wildlife. Dr Karl Kruszelnicki has shared the virtues of the dung beetle since the CSIRO introduced several species to Australia in the late 1960s. The objective was to manage a bi-product of grazing and its impact on fly control (the bi-product that wasn’t destined for our taste buds or footwear). Selected species were introduced to a number of Australian climates and ecosystems resulting in a biological control success story. Our approx 350-400 species of native dung beetle evolved to mostly feed on the smaller, drier, fibrous dung pellets of marsupials. Other examples of genus-specific relationships are applied in agriculture (both in pollination and pest management). 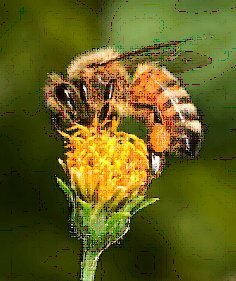 According to the Queensland Department of Agriculture, Fisheries and Forestry, Honeybees add an estimated $4 – 6 billion to Australian agricultural and horticultural industries, annually. 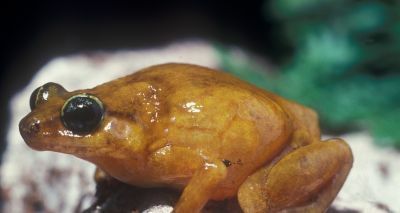 Further examples of identified animal groups have supported medical research. Studies of Tammar Wallaby and other marsupial forms of milk have provided medical researchers with a template for investigating antimicrobial compounds, potentially resistant to “superbugs”. Examples of animals helping humans can be ‘reciprocated’ in conservation campaigns. 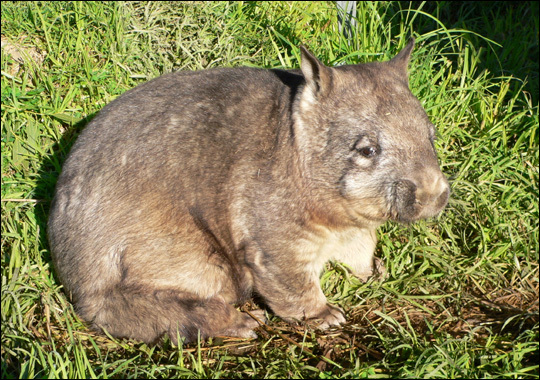 Most Queenslanders are aware of the plight of the endangered Northern Hairy-nosed Wombat. Distribution once extended south to the Victorian border. By the 1980s, a drastically reduced population was reportedly (without the advanced surveying methods in use, today) around 35 wombats. 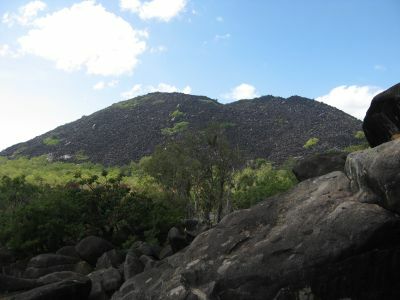 A remnant population in Epping Forest National Park (South-West of Mackay, Queensland) was recognised as the last chance to protect this species. Since then, wombat numbers have been carefully monitored and protected, reaching around 138 today. In 2009, the colony was deemed at risk should an environmental disaster such as fire or flood affect the region. To mitigate this, the decision was made to establish a second breeding colony 600km south at Richard Underwood Nature Refuge (near St George, Queensland). Recent reports (May 2012) indicate this second population is stable with the current “snout count” at seven females, three males and three joeys in good condition. A smaller cousin, the Southern Hairy-nosed Wombat has maintained a conservation status of ‘Least Concern’, although recent reports suggest it, too is affected by similar threats. These include reduced/replaced food plants and possibly toxins from introduced weeds. Relationships determined by the classification of animals can help us to make informed decisions. Are we prepared to learn from the past to determine the future? 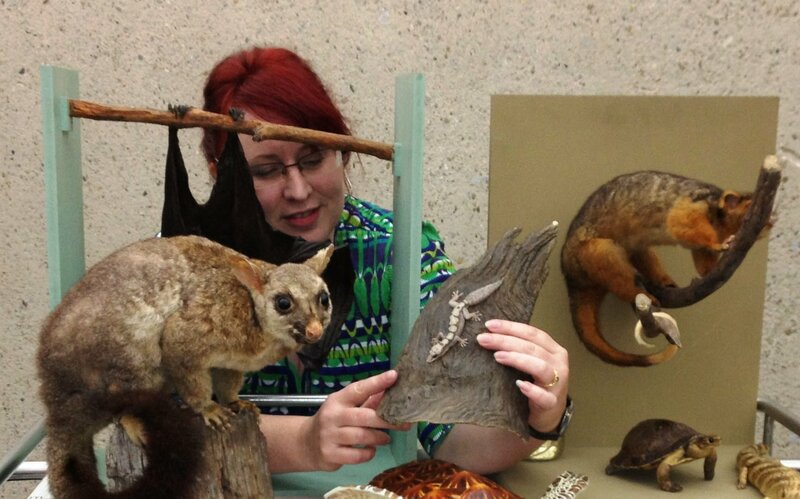 The Animal Classification theme is supported by a range of Queensland Museum exhibitions and resources. * Please note: Secondary school, teachers can also select a Biodiversity and Classification program, which can be tailored to your unit of work by prior arrangement. Humans are fascinated by extremes; just consider the popularity of the Guinness Book of Records. It’s also reflected by our fascination with huge dinosaurs; think Tyrannosaurus rex and Brachiosaurus. So it is not surprising that claims that ‘giant predatory lizards 11m long once roamed Ancient Australia’ would garner attention and intrigue. 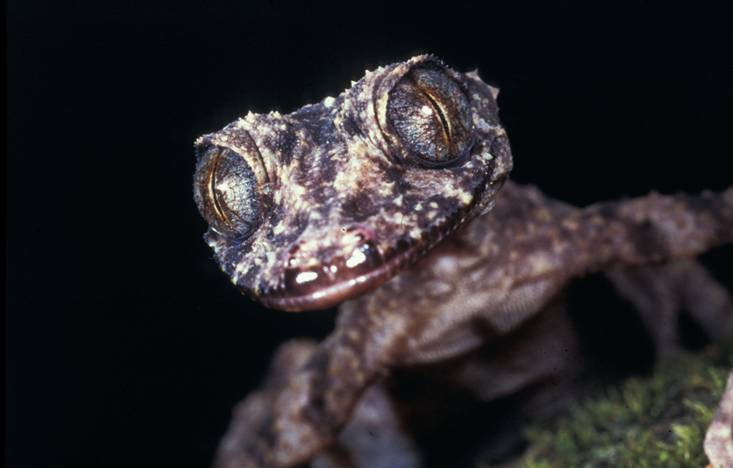 In fact the lizard was appropriately given the scientific name, Megalania, meaning ‘giant ripper’. But the search for the true size and nature of this giant reptile, reveals a story of misidentification, opposing ideas, inexact science and false assumptions. The story begins in the 19th Century, with a large number of fossils of a particular type being uncovered by land owners and naturalists. The size of the bones and teeth indicated that the animal was large. 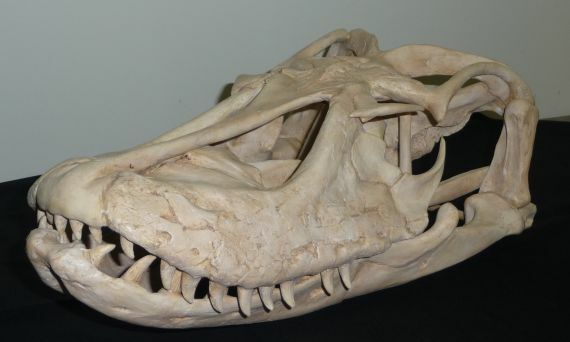 Many perceived the fossils to be of a dinosaur and others classified them as crocodilian. It was never dreamt of at the time that they could been the remains of a gigantic lizard (the Komodo dragon was unknown to science at that time). However, as fragments were combined and examined more closely, it gradually became clear that these were the remains of a giant extinct lizard living during the late Pleistocene, approximately 30,000-180,000 years ago. Well actually, it wasn’t that clear. In fact the science was decidedly murky. Many of the remains were incorrectly labelled for a long time, and were actually the bones of giant land tortoises, giant flightless birds or even giant marsupials. The opposite also occurred, with many bones identified as belonging to these groups, actually being those of Megalania. Debate among palaeontologists over these matters ruffled a few feathers. But the debate really got heated around the issue of the size of Megalania. Early estimates inferred a length of 3 m, but over time, the body length increased to 9, 10 and even 11 m—stupendously big for a lizard. It was almost as if a competition was being held: “my Megalania is bigger than yours”. Estimated sizes of the extant monitor lizards Komodo dragon and Perentie, compared to different estimated sizes of the “Megalania” (Varanus prisca). The ratio of claw length to body length from living goannas was applied to the fossil claws of Megalania. The only problem was that it is later discovered they were giant flightless bird claws – not Megalania. Determining the head length from skull remains, and then using the head-to-body length ratio of a lace monitor (alive today) to calculate a length of around 7-10 m. However, further research has identified that the ratio is much smaller in komodos and Megalania, so the size was a massive overestimate. The confusion of the Megalania story intrigued Queensland Museum palaeontologist and Snr. Curator Geosciences, Dr.Scott Hocknull. He recognised that as a key predatory animal, gaining an accurate understanding of it’s biology is essential in understanding the ecology of prehistoric Australia. So Scott travelled the country and even overseas to examine every Megalania fossil he could find. Meticulous measurements of the remains, and comparison with living goanna species, has helped test many of the assumptions previously made, and identified a total body length of between 5 and 6 m. This still makes it the largest lizard to have ever lived. Snr. 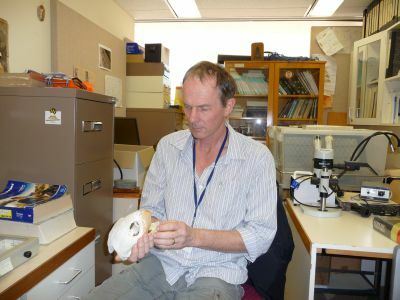 Curator Geosciences, Scott Hocknull, describes some of the features of a Megalania skull replica. This situation is a prime example of one of the AC: Science learning descriptors within the strand ‘Science as a Human Endeavour’. ‘Scientific understanding, including models and theories, are contestable and are refined over time through a process of review by the scientific community’ (Yr 9). Science is not always exact, assumptions are made and formulas applied. Scientists are also human and can become attached to particular theories. So should scientists assume anything? It’s not a very rigorous and reliable methodology is it? Assumptions are an inescapable and integral part of scientific research. In almost all cases when not everything is known about an object or topic, assumptions simply have to be made. The challenge is to minimise the number of assumptions, and when made, to ensure they are as valid as possible. Scientific investigation in one sense is all about testing assumptions and theories—by different people, using different approaches and as new evidence and material becomes available. Palaeontology is one area of science particularly susceptible to forming assumptions due to the fragmentary nature and scarcity of evidence. Uncovering a single bed of fossils can overturn theories held for decades. In fact, this is just what is occurring at the moment with the discovery of an enormous fossil bed at South Walker Creek. Scott and his team from QM are investigating this site, and early results indicate that it will substantially expand and change our understanding of Ancient Australian megafauna, including our very own mega-lizard.